Check Your Retirement Income Now Do you have a plan for retirement? Will you live somewhere new? What is your unplanned medical costs strategy? Will you support your children or they support you? Do you have an investment strategy for 30 years? Is your advisor/broker old enough to help you? Will inflation, taxes and fees destroy your future income? If you have not answered these questions BEFORE retirement, how do you know you can maintain your lifestyle for 30 years? Don&#x2019;t use &#x201c;Alternative Facts.&#x201d; You must visualize your retirement NOW. If you plan now, you can add an extra 25% to 50% to your income by using the low-cost and tax-FREE accounts others have found very helpful. The TrumpWorld has a different vision. There are so many unknowns in our futures that we must plan a FLEXIBLE financial future. We can anticipate some expenses but generally, we must plan for a range of possible futures. Trump says he will keep Medicare but GOP says it will cut benefits. He says he will rebuild America but GOP says it will cut spending. He postpones a rule requiring advisors to give us the best info. He wants more nukes but says no more wars. It is hard to know what he will do. How will you cope with TrumpWorld? For instance, if you stay invested in some stock mutual funds to overcome inflation, how can you avoid a prolonged flat market? If you count on fixed income vehicles like bonds or annuities, what will happen if inflation roars back? 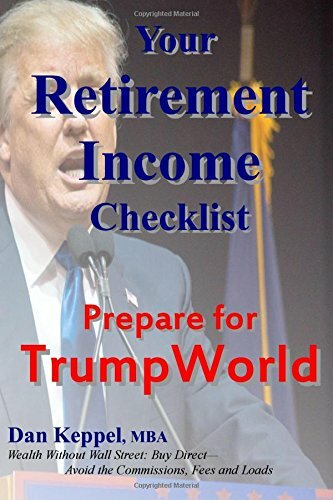 Today, retirees need to plan because TrumpWorld is unpredictable.